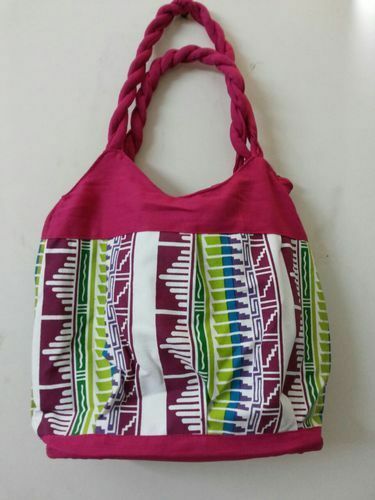 painfully created block printed bags. The art is descriptive of India and its vibrant colors. Green Bharat Ventures is a leading manufacturer, supplier, wholesaler, trader and exporter of bags from India. We produce and export a wide variety of Food Delivery Bags , Grocery Bags , E Commerce Bags , Online Delivery Bags , Cool Bags , Shake Bags , Apron Bags , Conference Bags Jute Bags, Canvas Bags, Laptop Bags, Designer Handcrafted Sling Bags, Handcrafted Ladies Clutches, Tote Bags, Delivery Bags, Belt Pouches, Candy Bags, Jute File Folders, Travel Wallets, Laptop Sleeves, Ipad Cases, Mobile Pouches, Bottle Bags, Tool Bags, Lunch Bags and Digital Printed Bags. We are an awarded company and have been honoured by many government and private bodies for our contribution to the environment. We are also members of EPCH (Export Promotion Council for Handicrafts). We have achieved a very good reputation in domestic and international market due to our consistent efforts towards customer satisfaction, total quality control and timely delivery. Please feel free to call onour number any time for your orders.